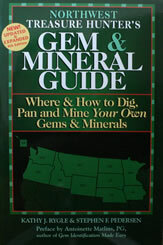 Where and How to Dig, Pan and Mine Your Own Gems and Minerals: Volume 1: Northwest States. 4th edition. This book is a 6" x 9" paperback with 184 pages.